'Magic Puzzle Quest' 1.6.5 Update Incoming! - D3 Go! ‘MAGIC PUZZLE QUEST’ 1.6.5 UPDATE INCOMING! For the first time, fight alongside your Coalition in an event! New and old events now have bonus Coalition rewards. Whenever you win Ribbons in an Event, you’ll also win Ribbons for your Coalition. The top Coalitions in each event will win Mythic cards, Boosters and more! For a full list of Coalition rewards, check the “Coalitions” tab under “Competition Rewards” on the event rewards menu. You can also check your Coalition’s score for each event in the Coalition menu, as well as your Coalition’s all time score. Face other players for control of the four shards of mana. 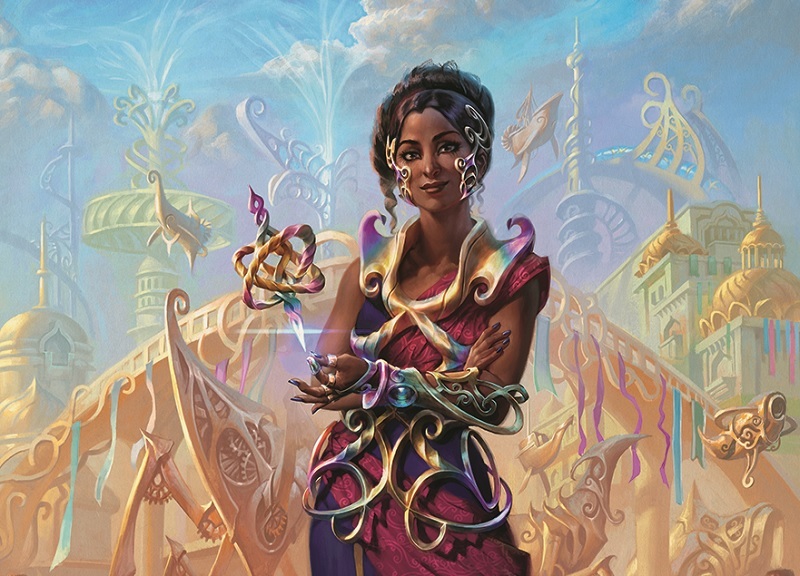 Play as the brand-new Planeswalker Saheeli Rai on the central node, and choose your best Planeswalkers for the other three. Fight enemy Planeswalkers and decks crafted by real players as you battle for prestige and power. Competition is sure to be fierce in Saheeli Rai’s Challenge, with smaller Leaderboards of only 500 players! Saheeli Rai’s Challenge will begin Friday September 2nd at 4pm UTC. Make sure not to miss it – Saheeli Rai’s Challenge will only appear this weekend! Rewards: The top ranked players will earn the limited-time exclusive Planeswalker Saheeli Rai at the end of the event! In addition, the top Coalitions have a chance to win Mythics, Fat Packs and more. Obtain 150 Ribbons during the event to win Mana Crystals, Runes and Booster Packs. Click on the “Rewards” button in-game for a full list of available rewards. Note that Saheeli Rai will not be available for purchase in the near future. The new update will have a brand new selection of special offers. Check in every week for new limited-time offers! Rattlechains: Spirits in your hand now correctly each gain 6 mana when Rattlechains enters the battlefield. Ghoulsteed: When returning Ghoulsteed to the battlefield through a Landfall when the battlefield is full, you now Discard 2 cards only if you choose to replace a creature with Ghoulsteed. Just the Wind: The card’s Madness will now properly trigger. Undergrowth Champion: Removed references to being immune to Destroy spells and effects. Inner Struggle: The card text has been fixed. It now reads “Deal damage to a creature equal to it’s Power”. Hope Against Hope is now a Spell rather than a Support. Please note that should this change break any of your deck’s limitations, you will be prompted to change your affected decks. – This card’s abilities are unchanged. The change was made because it made a lot more sense as a Spell than a Support. – The card now also properly gives First Strike to Humans only. True-Faith Censer: Now properly gives +1/0 only to Humans. Hermit of the Natterknolls: Now properly Transforms only when your opponent casts a card. Nagging Thoughts: Resolved issue with picking the 2nd card and it’s Madness ability will now properly trigger. Erebos’s Titan: Now properly returns to the battlefield when it is Destroyed. Prized Amalgam: The card now properly works and no longer freezes the game. Equestrian Skill: Now properly gives Trample only to Humans. Creatures that can Transform when playing 2 or more cards now Transform when playing two of the same creatures in a single turn. Silverfur Partisan: Now properly gains +4/+4 when a spell is cast on a friendly Wolf or Werewolf (previously would trigger off any spell cast). Briarbridge Patrol: Now correctly Investigates only when dealing damage to creatures. Creatures should no longer be stuck in a Transform animation. Incited Rabble: It’s activated gems are now properly removed from the board when bounced back to hand. Destroying Supports was incorrectly flagged as the Support being Discarded and could trigger Madness as well as cards that trigger abilities off Discarding cards. This issue has been fixed. Avacyn’s Judgment: Now correctly triggers it’s Madness ability. Indulgent Aristocrat: Now correctly Discards the first creature you control.